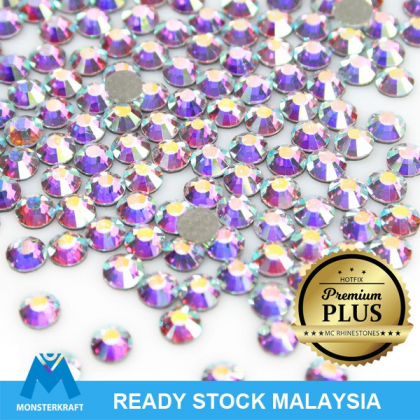 Gred AAAAA Hotfix PREMIUM PLUS Rhinestones comparable with Austrian SWAROVSKI or Czech PRECIOSA hotfix rhinestones, ala2 Very Shinning/copy Swarovski. HIGH QUALITY YET VERY AFFORDABLE BECAUSE WE'RE SELLING AT LOW WHOLESALE PRICE. Check rating / reviews from our customers, all 5 stars! Batu yang tunjuk dalam video ialah batu Saiz SS10, SS16 dan SS20. Rhinestones ini jenis tampal, ia ada gam di belakang (jenis warna kelabu), boleh gosok dengan seterika atau penekap manik (hotfix applicator). Glue: Grey color & strong. We're local seller (Malaysia) with Fast Shipping and Better Support. Orders will be posted out within 1-2 working days. Delivery is usually next working day or 1-3 days after posting (depending on the areas of coverage by Poslaju). Lost parcel? No worry, we will refund or repost to you. We're committed to produce & deliver quality products to your satisfaction. But in case any dissatisfaction with any item you have purchased, mail it back to us in the original unopened condition within 7 days, we will arrange full refund within 7 days. Copyright © 2019 Monsterkraft. All rights reserved.